Fishing in saltwater require a whole new approach from freshwater fishing. This includes much of your gear also, which will need to be overhauled. You need saltwater rods, a gaff, needle-nose pliers, saltwater reels, different clothing, electronics and other equipment that will make your saltwater adventures fun, safe and much easier. If you decide to surf fish, you need a couple of rods, a couple of rigs and some pvc pipe to stick in the ground for rod holders. If you decide to try your hand offshore then your trip will be only as successful as the gear you bring along. Offshore requires a whole lot more equipment and tackle. This environment, along with the fish that reside in it, can be tough on your gear. The good news is that today's saltwater fishing markets have made gear that will withstand the wear and tear, some lasting for years. Cheaper is not always better in this environment. Look for non-corrosive, UV-resistant materials of high quality. If you take care of your gear by cleaning it off with fresh water after you are done and lubricate the metal parts you should be able to enjoy it for years to come. Saltwater fishing is a blast and sadly many never venture in to this world. If you have the right gear it should be every bit as enjoyable as your freshwater fishing trips, if not more rewarding. Come by Texas Marine today and let us help you get prepared for your next saltwater fishing trip. Any of our knowledgeable staff would be happy to discuss it with you. New marine species are being discovered in the Gulf of Mexico. The Gulf of Mexico enjoys a multibillion-dollar fishing and tourist industry. During the BP oil spill more research dollars flowed into the Gulf of Mexico than ever before. As a result, new information is coming to light. Researchers have discovered new species of flat fish rarely seen due to the dark depths of ocean they choose to inhabit. 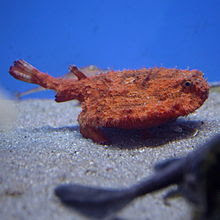 One of the new species is called the Pancake Batfish. They are called that because of the funny walk they use as they scoot along the oceans bottom, like a bat crawling across the floor. One researcher, from the American Museum of Natural History, found that one of the newly discovered species only dwells in the area that the oil spill was in. He was concerned that if we are just finding these new species of fish in the Gulf of Mexico that there is much more diversity out there to be discovered. This annual event is always a wonderful time of food, fun and fellowship for the Texas Marine team. Everyone including family members show up for the party! The team all gets together at Christmas time to celebrate, right before its time to close down for the holiday. Everyone brings food and appetizers. it is always out of this world. There is everything from the Roast cooked on a “Big Green Egg” grill to Cajun Gumbo, Italian Antipasti and, last but not least, the traditional TURKEY! Nothing is off limits or out of place at this unique Christmas lunch food feast! This years party was one of the best! Everyone had a blast visiting and sharing their Christmas plans for the year. This is the best team event all year!